ARA to hold on to its Malaysian malls? SINGAPORE-LISTED ARA Asset Management Ltd is planning to inject the five Malaysian shopping malls owned by ARA Asia Dragon Fund (ADF) via ARA Dragon Fund 1 (ADF1) into a private company. It will be a prelude to a listing exercise. ADF comes under the purview of ARA Private Funds, the private equity real estate unit of ARA Asset Management. It is learnt that ARA Asset Management, which manages ADF, had invited bids, hoping to fetch over RM2 billion, for the shopping malls — 1 Mont Kiara Mall, Klang Parade and Citta Mall in the Klang Valley, Ipoh Parade in Perak and AEON Bandaraya Melaka — in mid-2014, but it subsequently decided to opt for Plan B. The likely scenario now would be for ARA Asset Management to set up a new entity to take over the shopping malls. “Once the assets have matured, possibly within the next 1½ years, they will be listed,” a source says, adding that the listing could be in the form of a real estate investment trust (REIT), which is expected to be listed on Bursa Malaysia. “A plan is being finalised for the asset injection,” the source adds. ARA Private Funds CEO Ng Beng Tiong did not respond to The Edge’s enquiries on the new plan. He had previously stressed that investor interest will come first and maximising returns for the fund is imperative. The fund’s investment horizon is between three and five years. In late October 2014, Singapore’s Straits Trading Co Ltd (fundamental: 0.55; valuation: 1.2) acquired a 20.1% stake in ARA Asset Management from its CEO John Lim and Cheung Kong Investment Co Ltd. Cheung Kong is a unit under Cheung Kong Holdings Ltd, the flagship of Asian tycoon Li Ka-shing. ARA Asset Management (fundamental: 2.7; valuation: 2.1) also manages seven REITs, including Fortune REIT (fundamental: 2.2; valuation: 1.5), which is listed in Singapore and Hong Kong; Singapore-listed Suntec REIT (fundamental: 1.15; valuation: 1.5) and Cache Logistics Trust (fundamental: 1.30; valuation: 0.0); and Hong Kong-listed Hui Xian REIT and Prosperity REIT. ARA Asset Management established a presence in Malaysia in 2006 when it teamed up with AmBank Group to set up AmFIRST REIT (fundamental: 0.6; valuation: 3). The five shopping malls were acquired by ADF1 between 2010 and 2012, for an estimated RM1.3 billion. ADF1 was established in 2007 and has an initial fund term of seven years. It is a closed-end fund with a committed capital of US$1.3 billion (RM4.7 billion). According to ARA Asset Management’s website, ADF1 has invested in a total of 14 assets in China, Singapore, Hong Kong and Malaysia as well as emerging economies in Asia. The fund is currently in divestment mode as its lifespan has ended. The five malls, which have a combined 2.7 million sq ft of space, underwent an asset enhancement exercise in 2013. The bulk of the asset enhancement investment, more than RM200 million, was allocated for the upgrade of Klang Parade. Ipoh Parade and 1 Mont Kiara also underwent a renovation exercise but on a smaller scale. Following the completion of the renovations about a year ago, the occupancy rates of Klang Parade, Ipoh Parade and 1 Month Kiara rose to 88%, 90% and 80% respectively. ADF1 bought 1 Mont Kiara, comprising an office building and a retail component, from Aseana Properties Ltd for RM330 million in 2010. London-listed Aseana Properties is a 23%-associate of Ireka Corp Bhd. About RM20 million was spent on upgrading of the retail portion, which has a net lettable area (NLA) of 226,000 sq ft. While it was still under construction, AEON Bandaraya Melaka was acquired in the same year for RM710 million from general merchandise retailer AEON Co (M) Bhd. ADF1 purchased Klang Parade and Ipoh Parade from TMW Asia Property Fund in 2011. TMW is managed by Pramerica, the real estate investment management business of US Prudential Inc. The malls originally belonged to the Lion Group. Klang Parade went through a RM120 million makeover and now has an NLA of 660,102 sq ft. The renovation of Ipoh Parade, which has an NLA of 618,448 sq ft, cost RM90 million. 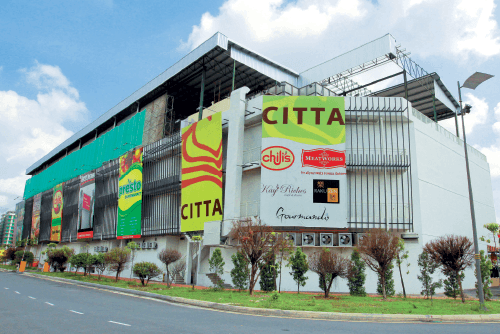 Citta Mall in Ara Damansara was purchased in 2012 for RM200 million. The shopping centre was developed by a joint venture between German real estate fund SEB Asset Management and property developer Puncakdana Group. It has an NLA of 436,006 sq ft.